I’ve read a few reports on the new release of iTunes, about CoverFlow view in fullscreen, advanced sorting options and the AppleTV preferences. However nice these are it’s not why I’m really happy about the update. 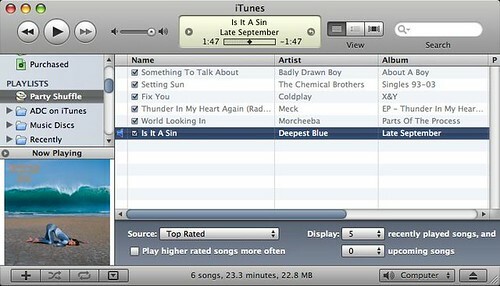 A feature has been reintroduced that was lost on iTunes 7’s original release. One that I had used for two years, one that I’ve felt lost without for the past six months. So what is this amazing old/new feature? Well it’s Party Shuffle’s ability to keep playing when there are no upcoming songs in the list. Alright, so that may not sound like a great feature, but honestly I love it. I can have it randomly choose tracks from my top rated playlist, and if I feel like I want to play a certain track, I can just drag the song onto the Party Shuffle icon and know that it’ll play next. I treat it almost as a queue for music, but unlike most music applications, if this gets to the end of my queued tracks, it’ll play a random song meaning I’ll always have music to jive to. I do have to wonder though whether there are any other old iTunes features missing in iTunes 7.